Work effectively to apply the latest rules for the safe storage, handling, and use of flammable and combustible liquids. Save time and avoid errors with the 2018 edition of the NFPA 30 and Handbook Set. Flammable and combustible liquids incidents are not only costly, they can have devastating consequences on a community. That's why compliance with the latest editions of NFPA 30 and NFPA 30A are an essential part of any fire safety plan. Be confident you're informed about evolving requirements -- in response to recommendations from the U.S. Chemical Safety and Hazard Investigation Board (CSB) and proposals from the field -- with this Set from the Code source. Gain a clear understanding of the hows and whys behind NFPA 30. Enforceable under OSHA and many state and local regulations, NFPA 30 is the best practice widely used in industry and by insurers. Engineers, contractors, consultants, facility safety directors, and enforcement officials -- everyone responsible for ensuring safety around flammable and combustible liquids needs this updated Set. Save 15% on the best tools for the safe storage, handling, and use of flammable and combustible liquids. Update to the 2015 NFPA 30 and Handbook Set! Incidents involving flammable and combustible liquids can have devastating consequences, and that's why compliance with the 2015 NFPA 30 is an essential part of any fire safety plan. Be confident you're informed about the latest requirements, including changes that respond to recommendations from the U.S. Chemical Safety and Hazard Investigation Board (CSB) and proposals from the field. Gain a clear understanding of the hows and whys behind the latest rules with the 2015 NFPA 30 and Handbook Set. Enforceable under OSHA and many state and local regulations, NFPA 30 is the best practice widely used in industry and by insurers. Engineers, contractors, consultants, facility safety directors, and enforcement officials -- everyone responsible for ensuring safety around flammable and combustible liquids needs this updated Set. The 2012 NFPA 30 Set provides code text plus answers and advice about flammable and combustible liquids. Get the latest and most complete criteria you need to protect your facility by ensuring safe storage, handling, and use of flammable and combustible liquids. Enforceable under OSHA and many state and local regulations, NFPA 30: Flammable and Combustible Liquids Code is the best practice document widely used in industry and by insurers. 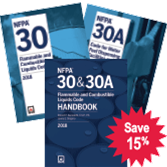 NFPA®'s exclusive NFPA 30 and NFPA 30A: Flammable and Combustible Liquids Code Handbook helps you apply new requirements correctly from the start! Incidents involving dangerous liquids can have devastating consequences. Be prepared with the NFPA 30 Set! Get the criteria you need to design facilities for better protection, comply with sprinkler requirements, and use safe operating practices with the comprehensive 2012 NFPA 30 Set.